The Chinese Labour Corps (CLC; French: Corps de Travailleurs Chinois; Chinese: 中国劳工旅; pinyin: Zhōngguó láogōng lǚ) was a force of workers recruited by the British government in World War I to free troops for front line duty by performing support work and manual labour. The French government also recruited a significant number of Chinese labourers, and although those labourers working for the French were recruited separately and not part of the CLC, they are often considered to be so. In all, some 140,000 men served for both British and French forces before the war ended and most of the men were repatriated to China between 1918 and 1920. In 1916, Field Marshal Sir Douglas Haig requested that 21,000 labourers be recruited to fill the manpower shortage caused by casualties during World War I. Recruiting labourers from other countries was not something unusual at that time. Other than the Chinese, labour corps were serving in France from Egypt, Fiji, India, Malta, Mauritius, Seychelles, and the British West Indies, as well as a native labour corps from South Africa. At the end of the war, an estimated over 300,000 workers from the colonies, 100,000 Egyptians, 21,000 Indians and 20,000 native South Africans were working throughout France and the Middle East by 1918. As China was initially not a belligerent nation, her nationals were not allowed by their government to participate in the fighting. As a result, the early stage of the recruiting business in China was somewhat sketchy, with semi-official support from local authorities. However, after China declared war against Germany and Austria–Hungary, on 14 August 1917, the Labour Department of the Chinese government began organizing the recruitment officially. The scheme to recruit Chinese to serve as non-military personnel was pioneered by the French government. A contract to supply 50,000 labourers was agreed upon on 14 May 1916, and the first contingent left Tianjin for Dagu and Marseille in July 1916. The British government also signed an agreement with the Chinese authorities to supply labourers. The recruiting was launched by the War Committee in London in 1916 to form a labour corps of labourers from China to serve in France and to be known as the Chinese Labour Corps. A former railway engineer, Thomas J. Bourne, who had worked in China for 28 years, arrived at Weihaiwei (then a British colony) on 31 October 1916 with instructions to establish and run a recruiting base. The Chinese Labour Corps comprised Chinese men who came mostly from Shandong Province, and to a lesser extent from Liaoning, Jilin, Jiangsu, Hubei, Hunan, Anhui and Gansu Provinces. The first transport ship carrying 1,088 labourers sailed from the main depot at Weihaiwei on 18 January 1917. The journey to France took three months. Most travelled to Europe (and later returned to China) via the Pacific and by Canada. The tens of thousands of volunteers were driven by the poverty of the region and China's political uncertainties, and also lured by the generosity of the wages offered by the British. Each volunteer received an embarkment fee of 20 yuan, followed by 10 yuan a month to be paid over to his family in China. Two of the unit's commanders, Colonel Bryan Charles Fairfax and Colonel R.L. Purdon, had served with the 1st Chinese Regiment in the Boxer Rebellion in 1900. Labour Corps men and a British soldier cannibalise a wrecked Mark IV tank for spare parts at the central stores of the Tank Corps, Teneur, spring 1918. A deal between the Chinese government and the allies resulted in the enlistment of thousands of Chinese who formed the Chinese Labour Corps (CLC) mainly poor Chinese men from the north who were told they would be in non-combatant roles. The Canadian government had restricted the arrival of all Asians and the CLC were secretly landed in Victoria, British Columbia. They were drilled in the old quarantine station at William Head and secretly shipped across Canada in cattle trucks. A total of about 140,000 Chinese workers served on the Western Front during and after the war. Among them, 100,000 served in the British Chinese Labour Corps. About 40,000 served with the French forces, and hundreds of Chinese students served as translators. By the end of 1917, 54,000 Chinese labourers were with the British Imperial forces in France and Belgium. In March, the admiralty declared itself no longer able to supply the ships for transport and the British government were obliged to bring recruitment to an end. The men already serving in France completed their contracts. By the time of the armistice, the CLC numbered nearly 96,000, while 30,000 were working for the French. In May 1919, 80,000 Chinese Labour Corps were still at work. The British soldier Arthur Bullock, in his wartime memoir, gives a vivid account of the interactions between the British soldiers and Chinese workers (whom he affectionately terms 'Chinks'). He also drew a sketch of one Chinese man, Tchung Camena Tungwa, who invited him to have tea in Beijing when he was next there (he never was). The workers, mainly aged between 20 and 35, served as labour in the rear echelons or helped build munitions depots. They were asked to carry out essential work to support the frontline troops, such as unloading ships, building dugouts, repairing roads and railways, digging trenches, and filling sandbags. Some worked in armaments factories, others in naval shipyards, for a pittance of one to three francs a day. At the time, they were seen just as cheap labour, not even allowed out of camp to fraternise locally, dismissed as mere coolies. 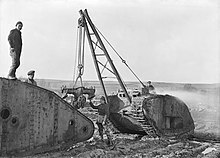 When the war ended, some were used for mine clearance, or to recover the bodies of soldiers and fill in miles of trenches. Men fell ill from poor diets and the intense damp and cold, and on occasion, they mutinied against their French and British employers or ransacked local restaurants in search of food. The harshness of the conditions in which some of these men worked is recorded by Arthur Bullock in his wartime memoir, along with the contemporary justification for it. Bullock also recalls the differences between the 'coolies' and the German prisoners of war, in terms of their attitudes to work and to each other. After the armistice, the Chinese, each identified only by an impersonal reference number, were shipped home. Only about 5,000 to 7,000 stayed in France, forming the nucleus of the later Chinese community in Paris. Most who survived returned to China in 1918. The contribution of these Chinese men went forgotten for decades until military ceremonies resumed in 2002 at the Chinese cemetery of Noyelles-sur-Mer. Throughout the war, trade union pressure prevented the introduction of Chinese labourers to the British Isles. Sidney and Beatrice Webb suggested that the CLC was restricted to carrying out menial unskilled labour due to pressure from British trade unions. However, some members of the corps carried out skilled and semiskilled work for the Tank Corps, including riveting and engine repair. One member of the corps, First Class Ganger Liu Dien Chen, was recommended for the Military Medal for rallying his men while under shellfire in March 1918. However, he was eventually awarded the Meritorious Service Medal, as it was decided CLC members were not eligible for the Military Medal. By the end of the war, the Meritorious Service Medal had been awarded to five Chinese workers. After the war, the British government sent a war medal to every member of the CLC. The medal was like the British War Medal issued to every member of the British armed forces, except that it was of bronze, not silver. After the end of the war Chinese labourers were given transport back to China between December 1918 and September 1920. The workers saw first-hand that life in Europe was far from ideal, and reported this on their return to China after the war. Chinese intellectuals of the New Culture Movement looked on their contribution to the war as a point of pride – Chen Duxiu, for instance, bragged that "while the sun does not set on the British Empire, neither does it set on Chinese workers abroad." The ill treatment of these workers, though, was added to the list of grievances against Britain. A more positive impact was on the educated youth who came to France to work with them, such as James Yen, whose literacy programmes under the auspices of the YMCA showed him the worth and dignity of the Chinese common man. He worked out a 1,000-character primer, which introduced basic literacy and became the basis of his work in China. Chinese intellectuals who worked with the CLC in France included Jiang Tingfu and Lin Yutang. The last surviving member of the CLC, Zhu Guisheng, died in La Rochelle on 5 March 2002 at 106 years old. He had also served in the French Army during World War II. The CLC did not usually perform in combat. According to the few records kept by the British and French recruiters, around 2,000 men of the CLC died during World War I, most from the 1918 flu pandemic and some as a direct result of enemy action or of wounds received in the course of their duties. Very few were armed to fight, but in regions with manpower shortages, they were given arms. In all, an estimated 10,000 died in the war effort, victims of shelling, landmines, poor treatment, or the worldwide flu epidemic. Some Chinese scholars, who contest these figures, say the number of deaths was as high as 20,000. Fifteen members of the corps were sentenced to death for murder during the course of the war. Four died and nine were wounded when British troops fired on them during disturbances in December 1917. The members of the CLC who died were classified as war casualties and were buried in about 40 French and Belgian graveyards in the north of France, with a total of about 2000 tombs and a few tombs in one cemetery in Belgium. The largest number of graves are at Noyelles-sur-Mer on the Somme, next to the workers' camp of the British army, where a cholera outbreak and some of the fiercest battles occurred, as well. The cemetery contains 842 gravestones, each engraved with Chinese characters, guarded by two stone lions, gifts from China. One of the four following epitaphs was inscribed on the standard Commonwealth War Grave Portland stone gravestones for members of the CLC: "Faithful unto death (至死忠誠 zhì sǐ zhōngchéng)", "A good reputation endures forever (流芳百世 liúfāng bǎishì)", "A noble duty bravely done (勇往直前 yǒngwǎng zhíqián)", and "Though dead he still liveth (雖死猶生 suī sǐ yóu shēng)", which are English translations of common Chinese idioms for soldiers. Ebblinghem Military Cemetery 1 The grave is numbered "106247" and bears the inscription "A good reputation endures forever." It is listed simply as a "Non-Commonwealth" grave in the register. Longuenesse(near Saint-Omer) There is a special memorial commemorating 23 men of the Chinese Labour Corps whose remains could not be exactly located. Noyelles-sur-Mer Chinese Cemetery and Memorial 838 A memorial commemorates 40 more who died on land and sea and whose graves are unknown. Ruminghem Chinese Cemetery 75 Half the burials were transferred from a Chinese cemetery at Saint-Pol-sur-Mer after the war. Saint-Étienne-au-Mont Communal Cemetery 170 Most of the cemetery's burials are Chinese. Liverpool Anfield Cemetery 3 Research by Professor Gregory Lee indicates that there are three further, unmarked, CLC in the "Chinese" section (Section 17) of Anfield cemetery. The original headstones of the three named CLC members buried in Anfield were recently replaced by the CWGC with new ones. In addition, 73 labourers have been accepted for commemoration by the CWGC after their deaths were discovered by the researchers of the In From The Cold Project. The majority are commemorated in the CWGC's United Kingdom Book of Remembrance, pending any discovery of their graves. Also, 10 Chinese labourers are commemorated at the Shot at Dawn Memorial, which memorialises British and Commonwealth personnel who were sentenced to death by court martial during the First World War. All 10 Chinese were executed for murder. ^ a b c "The Long, Long Trail: The Labour Corps of 1917–1918". 1914-1918.net. Retrieved 10 April 2014. ^ a b c d e The University of Hong Kong Libraries. "Fawcett, Brian C., "The Chinese Labour Corps in France, 1917–1921", in Journal of the Royal Asiatic Society Hong Kong Branch, Volume 40, 2000, pp. 33–111" (PDF). Sunzi1.lib.hku.hk. Retrieved 10 April 2014. ^ 中国日报. "《14万中国劳工参加一战：与德军搏斗 约2万牺牲》" (in Chinese). 人民网. Retrieved 13 September 2014. ^ Xu (2011), p. 27. ^ a b c d e f g The University of Hong Kong Libraries. "Waters, D., "The Chinese Labour Corps in the First World War: Labourers Buried in France", in Journal of the Royal Asiatic Society Hong Kong Branch, Vol. 35, 1995, pp. 199–203" (PDF). Sunzi1.lib.hku.hk. Retrieved 10 April 2014. ^ a b c d e f g h i j "The Chinese Labour Corps at the Western Front". Issuu. Retrieved 24 December 2018. ^ Xu (2011), p. 5. ^ Quarantined: Life and Death at William Head Station 1872-1959. By Peter Johnson. 2013. ^ Stay informed today and every day (26 April 2010). "The Economist: "Strange meeting", 26 April 2010". Economist.com. Retrieved 10 April 2014. ^ a b c "Peter Simpson, "China's WWI Effort Draws New Attention", VOANews.com, 23 September 2010". Voanews.com. Retrieved 10 April 2014. ^ a b c Picquart, Pierre (2004). The Chinese Empire (L'Empire chinois) (in French). Favre S.A. ISBN 978-2-8289-0793-8. Picquart, a French China specialist, gives a description of the fate of the Chinese workers. ^ "H09620". Australian War Memorial. Retrieved 5 December 2012. ^ "H09619". Australian War Memorial. Archived from the original on 15 January 2013. Retrieved 5 December 2012. ^ a b c Holmes, Richard (2011). Soldiers: Army Lives and Loyalties from Redcoats to Dusty Warriors. HarperCollins. p. 345. ISBN 0007225695. ^ "With the Chinese Labor Corps in France," in Charles W. Hayford, To the People: James Yen and Village China (Columbia University Press, 1990) pp. 22–27. ^ The University of Hong Kong Libraries. "Stevens, K., "British Chinese Labour Corps labourers in England", in Journal of the Royal Asiatic Society Hong Kong Branch, Vol. 29, 1989, p. 390" (PDF). Sunzi1.lib.hku.hk. Retrieved 10 April 2014. ^ http://www.infromthecold.org/casualties.asp. Retrieved 31 January 2017. Missing or empty |title= (help)In From The Cold Project website, search under Chinese Labour Corps. Calvo, Alex and Bao Qiaoni (2015). "Forgotten Voices from the Great War: The Chinese Labor Corps". The Asia-Pacific Journal. 13 (49). James, Gregory, The Chinese Labour Corps (1916–1920) (Hong Kong: Bayview Educational, 2013) ISBN 978-988-12686-0-0. Xu, Guoqi, Strangers on the Western Front: Chinese Workers in the Great War (Cambridge, MS: Harvard University Press, 2011) ISBN 978-0-674-04999-4. Tapley, Natt (2018). "Chinese Labour Corps in World War One with Wenlan Peng". Dan Snow's History Hit. Wikimedia Commons has media related to Chinese Labour Corps. St. Etienne-au-Mont Communal Cemetery on the website "Remembrance Trails of the Great War in Northern France"
This page was last edited on 24 March 2019, at 04:14 (UTC).